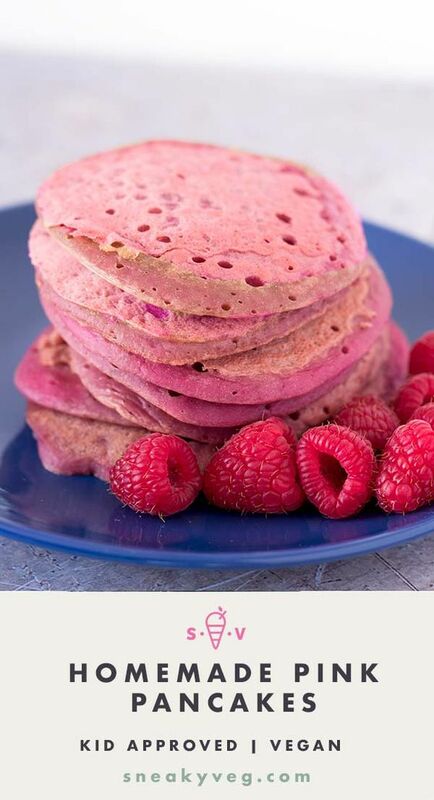 Delicious and healthy homemade pink pancakes that are perfect to make for breakfast this Pancake Day or indeed any day of the year if you love pink! No food colouring. Suitable for vegans. Heat a little oil in a frying pan over a low-medium heat and add a spoonful of the batter. Tilt the saucepan to allow the batter to spread out a little until you have the size and shape that you want. Cook for a couple of minutes until you can see bubbles appear on the surface of the pancake. Turn the pancake over with a spatula and repeat on the other side. Don’t be tempted to turn the heat up or your pancakes will turn brown. Keep warm in a low oven while you repeat with the remaining pancakes. Serve with maple syrup, fresh raspberries and yoghurt, or your favourite toppings.